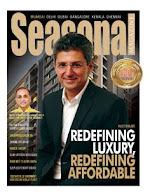 Seasonal Magazine: Oberoi IPO: Will Style Meet Substance? Oberoi IPO: Will Style Meet Substance? When Vikas Oberoi finally takes his realty firm public in the coming days, it will be in style, much like whatever he does. Like how he is acquiring the ‘The Beach’ in Goa now, how he cruised into Forbes’ 15 Youngest Asian Billionaires in 2008, and of course his Las Vegas engagement and dream wedding to former model and actress Gayatri Joshi. However, the public offer climate for realty is not much positive with realty indices failing to look up, lackluster performance of recent real estate IPOs like DB Realty & Godrej, and bigger public issues like Sahara Prime City, Lodha, & Ambience waiting in the sidelines. The IPO gets its style and substance from a 4/5 rating from CRISIL that indicates above average fundamentals. These days it is not sure whether even such a rating is enough to save a realty IPO, but one thing is sure, this rating is not common. Some of the reasons cited by CRISIL sound true. Oberoi Constructions had always steered clear of the developer’s practice of amassing huge land banks, which when the market goes southwards, can create life-or-death issues as now witnessed by DLF, Unitech, Parsvnath, and many more. At the same time Vikas has sometimes shown guts to outbid developers multi times his size, when he knows he is into something big. The best example is how he bagged GlaxoSmithKline’s corporate headquarters in Mumbai for $24 million. Secondly, Oberoi Constructions had made a name for itself in quality through their earlier projects. While those projects are nowhere in scale to what the firm is trying to do nowadays, that premium quality tag has enabled the firm to maintain better margins in the industry. The name Oberoi has also been a major factor. Mumbai headquartered Oberoi Hotels & Resorts has had a name in Mumbai for many decades. Though Oberoi Constructions has nothing much to do with EIH that runs the luxury hotel chain that includes Nariman Point’s Oberoi and Trident, the name must have surely helped. Anyway, that is a non-issue as the surname Oberoi has become even more popular with the emergence of Bollywood actor Vivek Oberoi who is incidentally a close friend of Vikas ‘Vikki’ Oberoi, like another close friend Akshay Kumar. Vikas Oberoi’s family was traditionally in the highly profitable saffron trading business, and it was from that his father diversified into the construction scene by starting Oberoi Constructions in 1985. The now 39-year old Vikas took the helm of Oberoi Constructions only in 1997, but ever since that it has been a round of good growth. One of the highlights of his stewardship has been attracting $152 million investment from Morgan Stanley. Oberoi Constructions is active in all the three segments of branded real estate – residential, retail, & commercial. Though the company going for IPO has only six completed projects, and that too in just four locations – Juhu, Andheri, Khar, & Goregaon, the promoter and promoter group have developed nearly 4 million sq ft across 30 projects. Which, of course, brings to the table the question of future competition among group entities. To allay such fears, Vikas Oberoi has signed non-compete agreements prior to the IPO that he won’t construct any project under the Oberoi brand, outside of this company, except in already identified projects. Vikas, who has been mulling this IPO for some years, is now also more realistic. The IPO size has come down from the earlier Rs. 4000 crore, and the Group is now limiting its focus only to Mumbai & Pune. But the main upside of this Issue will remain this young promoter’s track-record. Vikas ranked 717 in Forbes’ 1000 Worldwide Billionaires with an estimated networth of $1.4 billion in 2007.